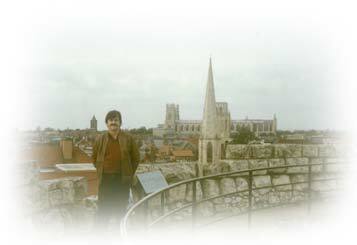 June « 2013 « Blog Marcos L. Mucheroni Philosophy, Noosphere and Ciberculture. Received in the comments of this blog quotes from sites Veja-Brazil and the Journal of the Brazil, the site presents data on corruption especially on how much would be the average salary of the Brazilian income distribution with and without corruption, the citation Blog was made ​​on the links and see Veja-brasil.com and JornaldoBrasil.info, big magazines here. Data on the average wage in Brazil were made ​​from the link which is mentioned in our blog and already warning in May, but was made from the data on the site JusBrasil, citing FIESP. Also in our post are data from Transparency International and Transparency Brazil. The Arab Spring in Egypt that overthrew the Mubarak, in power 30 years, and the impact of communication has also led to inspire young Egyptians creative initiatives in business, which is called start-up, as the BBC News. Even the idea of ​​brick by brick, as was common in the palestinian uprisings using stones, was now changed bit-by-bit by the use of social networks to defend themselves. But Mubarak came to cut the communications of protesters, then came to the fore ideas of collaboration and the power of crowd (crowdsourcing) to support the protests. 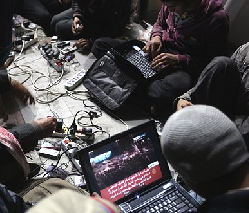 An example was the use of Bluetooth, which must be done within 20 feet, but the demonstrations in Cairo Tahrir Square used the known and then were all close, but still remained one last problem: the information must be decoded. A young man named Mohammad Omara, designer of semiconductor chips, made ​​an application which used no decoding, and then communication within a radius of 300 meters (Bluetooth better than normal) was possible, was created XoneBee. Many other ideas have emerged as the platform Nafham, which in Arabic means “we understand” who developed a teaching model mass, which is new education platform. The people’s back streets, the government elected by popular vote became authoritarian and manipulative. 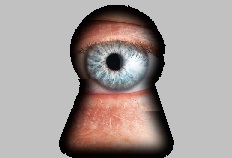 Cases recently revealed that Google, Yahoo, Apple and Facebook carry various forms of espionage in the accounts of users who are still reverberating in the world, now the initiator of the Web Tim Berners-Lee ruled stating that “things that happen on the Web are intimate”, claiming the right to privacy. While the demonstrations erupted in Brazil, the British newspaper The Guardian and the american The Washington Post reporting cases of the reach of the U.S. government surveillance on international communications networks, it would be only for “security” as a spy in Germany. According to the newspapers, one spy program called PRISM (abbreviation for Project Integration Sustainable Methods), were used by agents of the National Security Agency U.S. (NSA) to have direct access to the servers of a series large companies that manage private communications networks on the web. Outrage and national and international debate on the issue of privacy on the Internet is opened, while the Obama administration has seen its popularity fall. The Brazilian Congress which usually takes for analysis and response to popular questions, toppled on Tuesday the Proposed Constitutional Amendment 37/2011 (called PEC-37), which would limit the powers of investigation of the Public Ministry, became the heinous crime of corruption target and 25% of oil royalties to 75% for health and education. All this done within 24 hours, has also spoken to postpone parliamentary recess scheduled for July, a congressional amendment that usually stretches holidays and vacations. Norma Cavalcanti, President of the National Association of Members of Public Prosecution, attributed the victory to the Brazilian people in parliament. “Of course the people strengthened the cause and helped topple the PEC 37,” he said. The vote of the PEC-37que controversy would be obtained before: 430 votes against and 9 in favor and 2 abstentions. 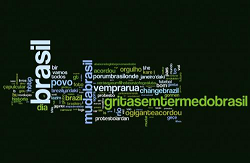 Twitter was celebrating the hashtags: #VemPraRua, # OgiganteAcordou, #PorUmBrasilMaisJusto, #SemViolência MudaBrasil, #Urnas2014, #ForaCorrupção, #InvestirEducação, #InvestirSaúde, #InvestirSegurança, # DignidadeJa of course and many others. 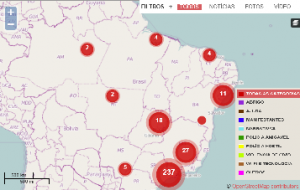 But the hashtag # protestobr brought a new one collaborative map information where they can be placed on a map giving the number of actions in demonstrations. The OAB (Order of Lawyers of Brazil), the CNBB (National Conference of Bishops in Brazil), the MCCE (Movement to Combat Electoral Corruption) and more than a dozen organizations gathered on Monday (24/06) and launched a bill popular initiative calling for a new political reform. The model is similar to the Clean Record Law, prepared by MCCE (Movement to Combat Electoral Corruption) that participated in the campaign already exists Clean Elections website, the motto of the campaign reminiscent of the “Clean Record” (applicants without criminal record) , also initiated by these entities. 1. Bill popular initiative to attack a political reform that electoral corruption, ensure ample freedom of expression on the Internet, in addition to stimulating the creation of committees of social control of public expenditures, including those relating to the World Cup and on worksheets transportation. 2. Expand investment in health and education, with 10% of the Federal Budget and GDP, respectively. 3. Creation, urgent, a Code of Defense of Users of Public Services. To transact the project in the National Congress is required to have 1% of the electorate subscription (more then 1 million), the site recorded until yesterday afternoon near 23,000 signatures. 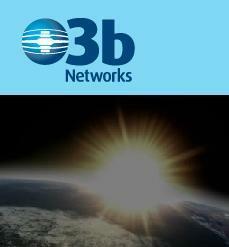 On board a Soyuz spacecraft was launched from French Guiana yesterday four satellites that will operate the network O3b (Other 3 Billion), which will offer an internet connection of high-speed low-priced price for 3 billion people to 180 countries. The idea emerged in 2007 from the mind of American Greg Wyler, pioneer of 3G telephony and founder of O3b Networks, traveled priate for Rwanda. The satellite will cover a range of 45 degrees around of Ecuador Line, thus covering poor regions of Africa, Latin America, Southeast Asia, Australia and Oceania. Analysis of tweets in blog of Raquel Ricuero indicates a growing politicization of the issues, but otherwise the withdrawal of some leaders concerned about the direction and a direction not obscure the course of demonstrations, the use of opportunistic and / or desires other than the people. For our part we will continue to support by understanding the social and political issues raised are so fundamental to the Brazilian people, for the country’s future and for greater accountability of politicians. Also commendable is the participation of ordinary people and ordinary population, the progressive social forces can not abandon the popular clamor of the streets, periphery also get to participate, there are already events planned in Campo Limpo and Capao Redondo (SP-state) and the Rocinha favela (RJ-state) for today. Major changes require efforts, tensions are not comfortable for anyone, it is understandable even some discontent within the movement itself, but you must have a safe driving that point to deeper issues. The Brazilian people expect their leaders do not abandon them. Unfortunately some groups fell free pass as is the case in São Paulo, but the people in the streets will keep fighting, because structural changes are necessary in the country. The curve of interest in issues of corruption and posts on Facebook and Twitter show the growth of motivation around the subject. In several demonstrations across the country it was already present, should now be new leaders able to understand the popular yearning for change and a real fight against corruption, as the parties involved have no interest and blocking the changes. 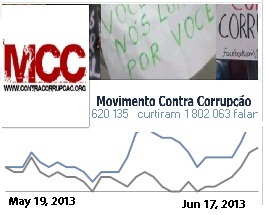 Facebook link “contracorrupção”, 620 135 had already tanned and 1,802,063 people were talking about it. The blog of Rachel Ricuero, brazilian expert in m, analyzes the change of axis through tweets, and for its easy analysis of the networks realize that these shafts were changing over development of manifestations, now with greater emphasis on the changes country, as was to be expected. 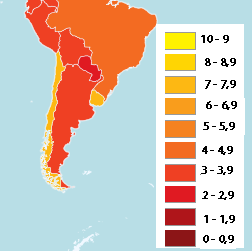 The Non-Governmental Organization (NGO) Transparency International released in 2012 the indices of the least corrupt countries in the world, at the top of the countries with greater honesty, with grades 0-10 were: New Zealand: 9 Denmark: 9.4; Finland: 9.4 and Sweden: 9.3, at the end of the list, the most corrupt were: Sudan: 1.6, Iraq 1.8, Haiti 1.8 and Venezuela 1.9. Brazil was among the reprobate, in 73.th place with 3.8 and among our neighbors Uruguay and Chile are in 20th. and 21.th place, and the reprobate Argentina with 3.5 in 103.th place and Paraguay with 2.5 in 150th. place. It is believed that these cases were ascertained can double or even quadruple, according to the Association of the Servants of the Court of Rio Grande do Sul, and the vast majority of those involved are not arrested, the money was not returned and it is for this very political reasons. According to a survey of FIESP (Industrial Federations of São Paulo), per capita income in Brazil increase by 15.5% without corruption, and could be of $ 9000 (£ 18,000 actual) value or the middle class receives, ie, beyond corruption is no concentration of income. The recent case of the gaff Carlinhos Cachoeira, which involves the contractor Delta, continues with comings and goings, and only your accountant stuck. Everyone politicians will the TV saying that that protests are right, then are fair culprit: the butler. According to the website conecta-i, which is part of the IBOPE group (social researches), 94% of Internet users support the demonstrations. The main manifestations are hashtags: # ProtestoBR used to deal with protests across the country and # PasseLivre used to summon the demonstrations since the beginning, from where they were born regionals: # ProtestoRJ (the Rio de Janeiro), # ProtestoSP (St. Paulo), # ProtestoCE, # ProtestoBH, #ProtestoDF, # BelémLivre and #VemPraRua. There are many other smaller presence, but very active as VemPraJanela #, and # NãoÉPor20CentavosÉPorDireitos #ObrasilAcordou or #PrimaveraBrasileira and PrimaveraGlobal, comparing the process with the Arab world. One on flags that grow are the PEC37 #, and # # CopaPraQuem ChangeBrazil. # SemViolência is one of the slogans of the protests that direct peaceful demonstrations. The agency Digital Today reports that the protests have generated 548 944 publications in major networks, and Twitter was the most used, with 88% (about 483 839 posts). Facebook’s next 60 000 posts, around 10%, while Google+ and blogs corresponded to the remaining 2%. 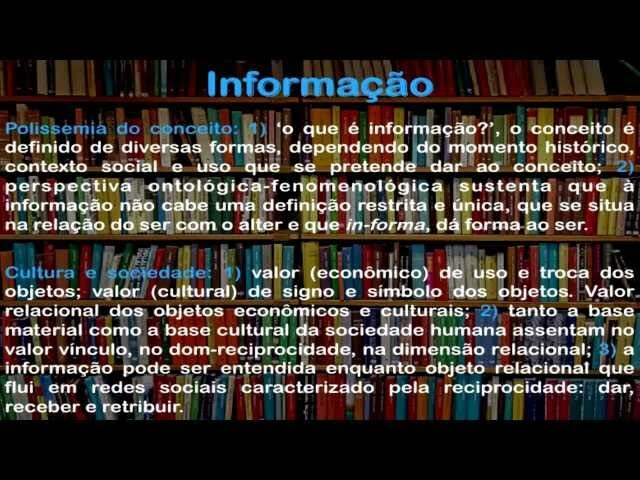 But there are no figures on the hits (access) and shares, but social networks occupy a special role in the manifestations of Brazil.